Stop trying to play it cool, you know it’s a thing. You’re sitting there. It’s going to be a while. You might as well relax. So, what are you going to do? Check your email for the umpteenth time or argue with strangers over politics on Facebook? That doesn’t sound very relaxing. But you know what is? Uncle John’s Plunges into Texas. 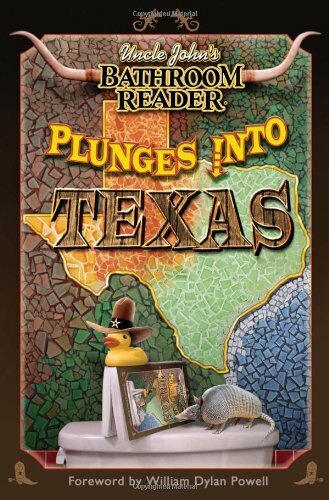 That’s right, the popular Uncle John’s Bathroom Reader series messed with Texas after all—and the result is a wildly entertaining tour of one of the most interesting places in these here United States. From history to folklore to larger-than life people and institutions between the Red to Rio Grande, Uncle John’s Plunges into Texas is an info-packed collection of short, shorter and shortest tales and trivia that interests Texans and Non-Texans alike, y’all. Order Uncle John’s Plunges into Texas on Amazon and get your copy in two days with Amazon Prime!